Today's post is brought to you by the fabulous Laura of A Beautiful Plate. Not only is she a lovely new friend of mine, but she can bake up one mean cupcake (seriously, how cute are these?!). Show her some love! Note: Candied clementine slices should be prepared a day or two in advance, ensuring that they dry sufficiently before sugaring and being placed on the cupcakes. The cupcakes, themselves, are best served the day of baking. Preheat oven to 350 degrees. Add liners to cupcake tin. In a medium bowl, whisk together cocoa and boiling water until smooth. Set aside mixture and allow it to cool to room temperature. Once cocoa mixture is at room temperature, lightly combine the eggs, 1/4 of the cocoa and water mixture, orange extract, and vanilla in a separate bowl. Set aside. Add sugar and grated clementine zest to large mixing bowl (or KitchenAid bowl). Using fingers, rub the sugar and zest together until moist and aromatic. Add in remaining dry ingredients and mix on low speed for about 30 seconds to combine. Add the butter and remaining cocoa/water mixture and mix on low speed until the dry ingredients are moistened. Increase to medium speed and beat for 1 1/2 minutes to aerate. Scrape down sides of bowl with spatula. On low speed, gradually add the egg mixture in 3 additions, beating for 20 seconds after each addition to incorporate the ingredients, scraping down the sides as you go. Using ice-cream scoop or spoon, distribute the batter evenly among the cupcake tin. Bake for 15-18 minutes (rotating half-way)—do not over bake! Place cupcake tin on cooling rack and allow to sit for 2-3 minutes, before removing the cupcakes and allowing to cool to room temperature on rack. Once cooled, dip and cover with dark chocolate ganache. Best served the day of. Heat cream in glass measuring cup (watch carefully!) in the microwave in small increments of 15-20 seconds. Cream should be hot, but not boiled. Pour the cream over the chocolate and allow the mixture to sit for about 15 seconds. Whisk very slowly until cream and chocolate come together and it becomes very smooth and shiny. Do not overmix. 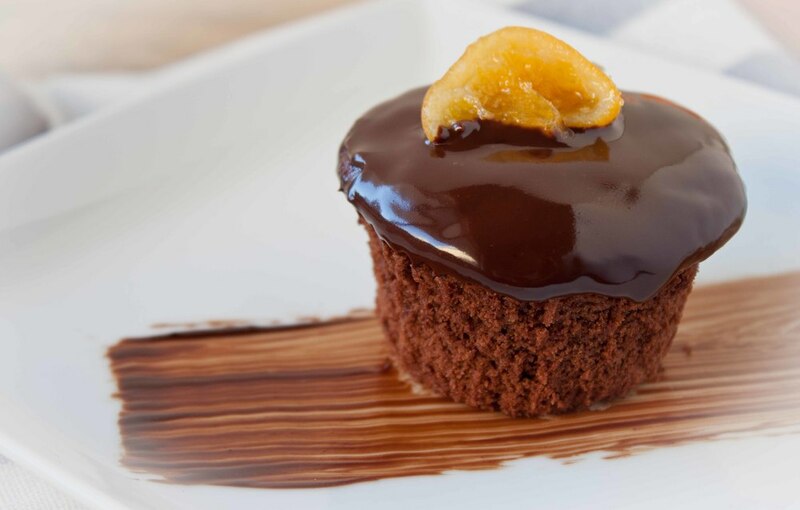 Dip cooled cupcakes (ensuring that you do not dip beyond the liners) into ganache. Let cupcakes sit at room temperature to set. Once the ganache is almost set, place a candied Clementine slice in the center of the ganache as a garnish. Clean each clementine well, ensuring that any wax coating is removed. Using sharp serrated knife, cut of top and bottom of each clementine. Cut each clementine into ½ inch rounds, removing any seeds. Bring a large pot of water to boil and drop in the clementine rounds. Boil for 2 minutes, then drain the rounds in a colander and rinse immediately with cold water. Refill the pot and repeat the boiling, draining, and cooling once more. Rinse out the pot and add four cups of water. Stir in sugar and bring to a boil. Return clementine slices to pot, cover, and reduce heat so that the syrup simmers gently. Cook the clementine slices for roughly 30 minutes, stirring occasionally. Remove the pot from the heat and allow the slices to sit in the syrup over night at room temperature. Remove the slices from the syrup, lay on greased cooling rack and allow to dry. Toss the slices into fine sugar until lightly coated and shake off any excess sugar. Use as garnish on cupcakes.